The Small Grants cycle is ongoing. Click here to view the full descriptions of current Small Grants Program Request for Applications (RFA). Click here to view the Small Grants Application Manual to navigate through the application process. Please go to GeMS to start your application. Contact the Komen Hawaii Mission Director at mission@komenhawaii.org or 808-754-6659 if you have any questions. Komen Hawaii awards community grants to organizations that provide breast cancer projects that address specific funding priorities which were selected based on data from the 2015-2018 Komen Hawaii Community Profile. Although Komen Hawaii is not accepting applications for Community Grants this year, we are accepting applications for Small Grants, and we are investing funds into the Treatment Assistance Program that supports patients who qualify from the state of Hawaii. 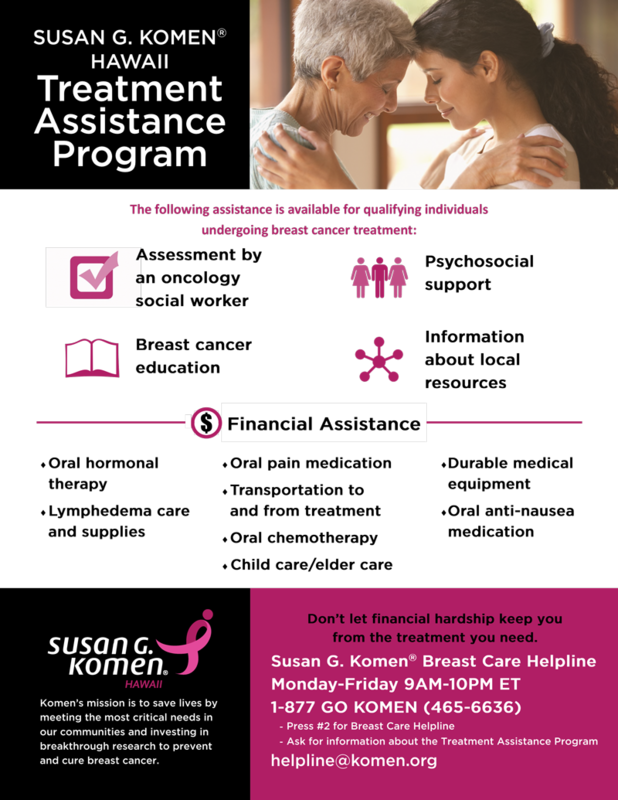 The SUSAN G. KOMEN TREATMENT ASSISTANCE PROGRAM makes funds available for qualifying breast cancer patients. Susan G. Komen is pleased to partner with CancerCare® to offer a financial assistance program to help breast cancer patients living in Hawaii. Financial assistance is granted to breast cancer patients who meet CancerCare’s eligibility criteria. For more information and to apply, please contact a CancerCare social worker at 800-813-HOPE (4673). Funding for this program is provided by Susan G. Komen Hawaii, call 808-754-6659 if you have any questions.